The WolfPack women’s basketball team started their regular season with two victories over the MacEwan University Griffins. In their season opener the ‘Pack beat the Griffins 72-58 on Friday, Oct. 27, here in the Tournament Capital. It was a game where TRU started slowly but ultimately dominated. The ‘Pack had three players who scored eleven points, Emily Vilac (fourth year, forward, Kamloops), 11 points, 6 rebounds, Chelsea Hoey (third year, forward, Parksville, B.C. ), 11 points, 6 rebounds, and Maddy Neuman (third year, guard, Calgary, Alta. ), had 11 points. Coach Scott Reeves was happy with his team’s performance and felt his team played with a lot of energy and excitement. Reeves also expressed his desire for his team to have greater concentration, especially in the fourth quarter where TRU faded a little bit before closing out the contest and securing the win. TRU managed to beat the MacEwan University Griffins once again on Saturday, Oct. 28, at the Warner Rentals Courts in the Tournament Capital Centre. The ‘Pack won a nail biter, 65-61. TRU led 32-25 at half-time. The Griffins came back stronger in the second half to take a 52-51 lead in the fourth quarter, from that moment on the game was back and forth with the teams exchanging leads, like two heavyweight boxers exchanging haymakers. Tensions were high at that point, as both teams new a mistake could cost them the game. 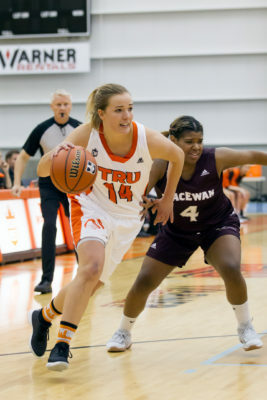 TRU came up with a big play with eight seconds left in the contest, Shenise Sigsworth made a block when MacEwan attempted a three-point shot. TRU was led by Michelle Bos (fourth year, guard, Surrey, B.C. ), 15 points, 8 rebounds and Leilani Carney (third year, guard, Burnaby, B.C. ), 15 points and 3 rebounds. And coach Ferguson also continued saying his team needs to put pressure from the start of the game, as they started slowly in the first quarter in both games.